The Hon’ble Chief Minister of Jharkhand has unveiled a new scheme HYHV recently in the village Sona Dhani. It is situated in Littipara in the district of Pakur, Jharkhand. The scheme is pitched for the overall development of villages, which will include all the development aspects. The scheme will strengthen the gram panchayats and will empower them to work for the development of the rural villages The CM has indicated that the state Jharkhand has all its potential but the villages are still on the backward foot and needs several central as well as state schemes for their growth. The village chief or commonly known as Mukhiya, Mantu Mahato was also present in the program. 2 Implementing state Jharkhand, India. The Chief Minister has clearly stated that the development of the entire state totally depends on the full development of the villages and rural corners of the state. Total gram swaraj has to be achieved so that to empower the village panchayats to become stronger and carry on the development works in the villages, with the help of state government and its various sponsored schemes. Apart from gaining economic as well as social empowerment, the villages and gram panchayats needs political development too. The villagers must be given social justice, especially gender equality so that they can contribute to the overall development of the state. This will also include the cultural and religious development of the villagers in a positive way. The CM of Jharkhand has promised to give full support to the gram sabha and panchayat bodies to indulge in the several state sponsored schemes which will help in overall development of the village people. Several gram sabhas or panchayat level meetings will be held in each and every block of all the districts in Jharkhand which has already been inaugurated from 19th The gram sabhas will continue till 31st October, to discuss various issues regarding development of the villages and implementation of several social and financial schemes by the state government. The CM has made an appeal to all the village panchayats to set a 15 year working and development plan in their own villages. The gram sabhas will be two days affair where all the representatives of the village panchayat along with state govt. representatives from the blocks will be present. Three year schemes are to be selected in the gram sabhas. Regular gram sabhas : The village panchayat representatives must sit with the common villagers to work out feasible solutions of several problems and issues. Schemes which will directly benefit in the socio, economic, cultural and political development of common people must be implemented with immediate effect. Necessary support will be provided by the state govt. The CM has stressed on the Gandhi’s dream to have self governance in the villages where the villager’s problems will be sorted out by the panchayats only and will not require external intervention. Providing Basic amenities to the villagers: The gram panchayats will have to work out so that the villagers will get all the basic amenities in their homes, the first of all will be drinking water for all. After that, the village streets will also be pucca and will be well connected with the towns. Proper waste management and drainage systems must be present in the villages. The weaker sections of the society living in the rural pockets will also be assisted with housing solutions. The state govt. will fully support in implementation of its several social schemes in the rural areas. The CM also stressed on having toilets in every village homes. The aspect of water conservation will also be handled with the development of ponds and dams meant for irrigation. Providing employment opportunities: The state govt. will lend full support to the gram panchayats to implement several employment and skill development programs in the village level. Small village level plans like gobar gas projects, solar light projects, dairy farms, etc. needs to be promoted which will increase the chances of employment for the local villagers and bring economic development. The youths are to be joined with several skill development training which will boost their chances to get employment in the state as well as in other states. The Jharkhand government is all set to implement a number of new schemes, which have been implemented solely for the betterment of the state residents. 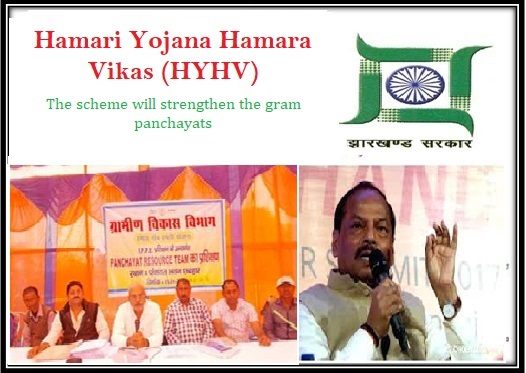 In this respect, Jharkhand government has announced Hamari Yojana Hamara Vikas Scheme. The common people will receive information about the several developmental projects. If you want to know more about this scheme, then click on the official link HYHV Notification 2018, you will attain detailed information about the new project.